Submitted by Alexander Briones on Dec. 20, 2017. Originally published on May. 24, 2016 and updated on Dec 21, 2017 . Stage monitors, also called floor/wedge/foldback monitors, are speakers positioned to let performers hear themselves properly on stage. As such they are as important as FOH (Front of House) speakers, some say even more so, because they directly affect performance. Here we take a look at the best stage monitors in the sub $500 range. Since floor monitors provide good area coverage, they are what most people use. For this update, we've decided to limit our scope to those within the $500 price range, since it is the price range that most are looking into. There are others who prefer using in-ear stage monitors, which you can find in this other guide. These are market leading powered speakers that are highly rated as floor monitors. Incidentally, many of them are also great FOH speakers. This highly rated powered speaker cabinet is a market favorite when it comes to portable and versatile speaker systems. Weighing in at just 23.2 pounds, the Yamaha DBR10 packs quite a lunch of punch, with its 10" LF Driver, 700W (Peak) power rating and max SPL of 129dB. And since it is also top rated PA speaker, it can serve as a reliable backup for your FOH speakers. Its power, portability, flexibility, and Yamaha's reputation for quality makes for a potent mixture of practical traits that many are looking for in a stage monitor. Commendations continue to point to its clean sound, good projection and portability. Users who switched to the Yamaha DBR10 are happy with its performance, reporting that they get the same, if not better, sound, at a more affordable price point and more importantly, at just around half the weight compared to other models. While it does work great as FOH mains and side fills, experts have noted that it works even better as a floor monitor, with its clarity and quiet operation - especially for vocals and acoustic instruments. The rating would have been higher if not for some users who wanted more bass and projection from its compact 10" speaker, they should have known better and bought something bigger. An expert reviewer cautioned that it can't handle too much lows, but said that this is a physical limitation rather than a fault on the speaker - and it would not be an issue for most musicians when used as a stage monitor. If you are looking for a quality monitor that's light on your back and your bank, then definitely get this one. Electro-Voice is known for providing speakers with good specs at a more affordable price point, and the ZLX-12P is a good example of how successful their strategy is. At just under $400, this powered speaker can get really loud with its 1000W (Peak) class D amplifier built in, which drives a 12" woofer and a 1.5" tweeter. Positioning flexibility makes it an even better deal. But what really makes it a market favorite is its clean Hi-Fi sound, which makes it a viable stage monitor with more bottom end, thanks to its 12" speaker. While there's really no extra or special features to speak off, the Electro-Voice ZLX-12P is known for doing what its supposed to do, and do so excellently. What we found are mostly favorable reviews, commending the unit for its transparent sound and great projection. And this is specially obvious for users who have set up the EV ZLX-12P as a floor wedge, they reported that the high headroom allows for a musically dynamic sound that inspires them to play better. This speaker is a bit on the heavy side at 34.39 lbs, but it still relatively light when compared to other active speakers with 12" woofers. Of the few other complaints, we found that they are mostly about shipping damage and manufacturing defect claims that would be resolved through the retail store. 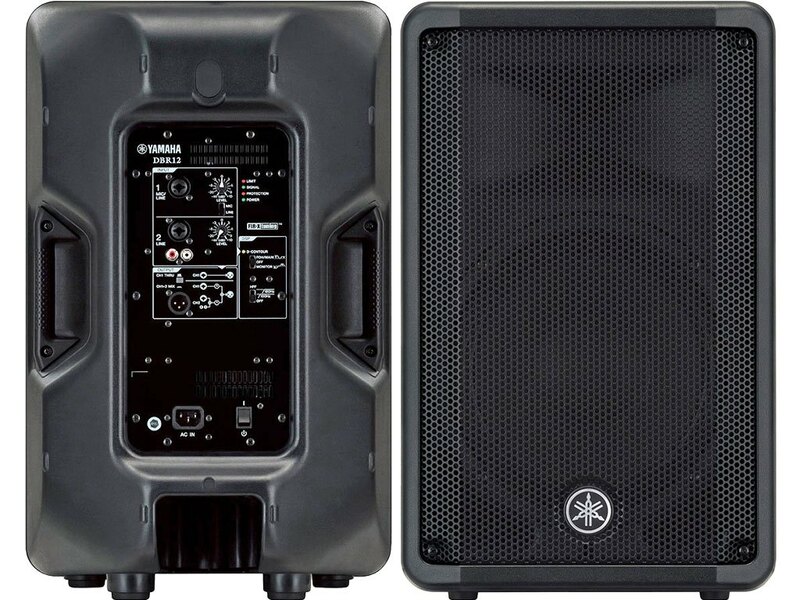 This is easily a good bang per buck powered stage monitor that should be looked at if you're looking for a reasonably priced 12" monitor speaker. 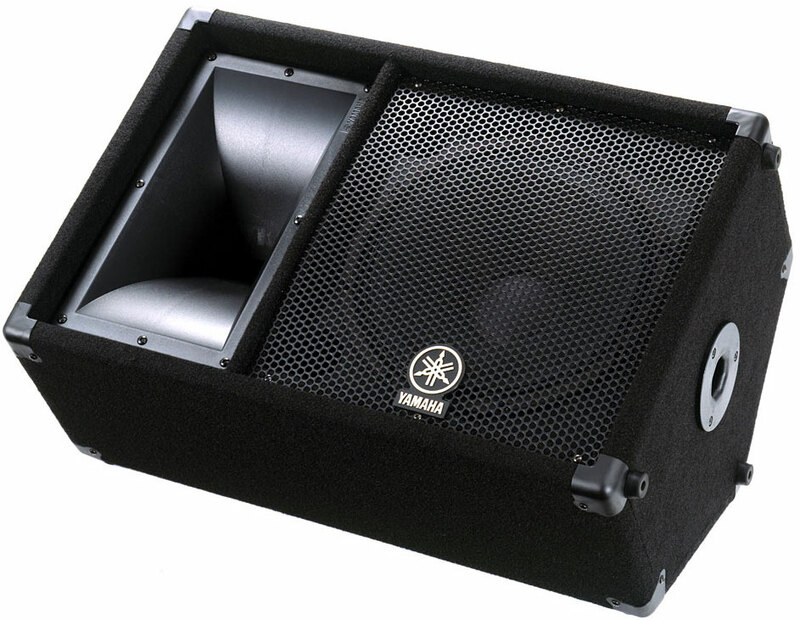 With its 131dB SPL and 12" woofer, the Yamaha DBR12 has enough projection and low-end for competent FOH use. But since it has Yamaha's clarity and built-in EQ capabilities via the D-Contour switch, it continues to be highly rated for being a good monitor speaker. It operates similar to the smaller DBR10, but with a slightly bigger profile that allows for a bit more bass frequency emphasis. With its versatility, the DBR12 is a true all-in-one stand-alone speaker that can serve many purposes. While mostly used as main speakers, there are many that commend the Yamaha DBR12 for its outstanding performance as a floor monitor. Many users love its good balance of projection, bass and portability, which makes it ideal for mobile setups. Good reports continue to flood in from singers, musicians, speakers and some even use it as monitor for electronic drums. Even experts like Mike Croft of Sound on Sound had mostly good things to say in his review, which he concludes: "They are powerful enough for small-to-medium live-sound gigs, have a pleasing smoothness and warmth to the sound even when driven hard, are lightweight and easy to handle, and they make great stage monitors". There was one user who wished that the control panel was positioned better, but since this speaker also works as a FOH, this standard positioning is expected. If you're looking for a reliable and loud (yet still portable) stage monitor, then consider the Yamaha DBR12. The Turbosound Milan M12 is a powered loud speaker that packs quite the punch. It sports a powerful 1100W (Peak) amplifier, and a 12" woofer, more than capable of handling main speaker duties, yet it is well loved for its fuller sound when used as stage monitor. It also has a switchable 100Hz low-cut filter, which works in conjunction with its built-in DSP to give it more midrange emphasis and stops low-end rumble when used as a floor monitor. Market response to the Milan M12 is mostly positive, with most users pointing to its value for money and enhanced low end as its best traits. One user describe the sound as having a "serious low end", which is important to musicians and DJs who utilize bass frequencies. There were a few who were not too sure about the brand, but found themselves impressed enough to buy one after trying them out. The speaker's bulk and weight is also a cause for concern, but it is relatively light compared to others with the same size and power rating. 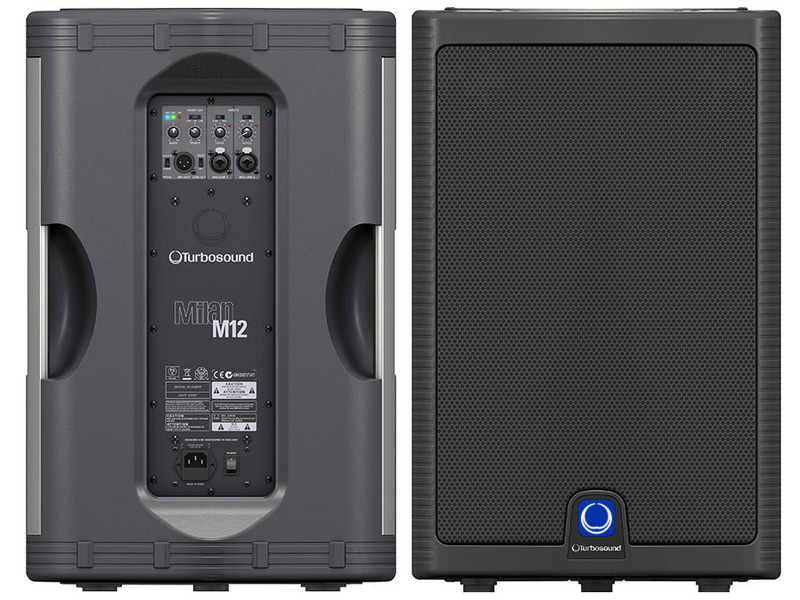 If you're looking for a stage monitor with more low-end oomph and projection, then get the Turbosound Milan M12. 91 out of 100. Incorporating 550+ ratings and reviews. Behringer continues to provide affordable music gear that keeps other manufacturers on their toes. The Eurolive B205D follows their successful strategy as it balances quality and affordability. This portable powered speaker is the smallest and lightest in this list, weighing at just 7 pounds, equipped with just a 5.25" LF driver, and a 150W amplifier which may seem way under-powered compared to the others. But reviews reveal that the projection of this monitor is just enough for small stages and venues. The Behringer Eurolive B205D is ideal as a stage monitor for vocalists and keyboardists thanks to its mic stand mountable design. It's also a great speaker for small-scale public address - just plug a microphone directly into the B205D and you're ready to be heard. And since it has front mounted controls, making on fly changes to your sound is possible without the need for a technician's help. Speaking of controls, the 3-channel mixer gives you mic and line inputs, including RCAs for music players. And the 3-band EQ lets you fine-tune your sound easily. 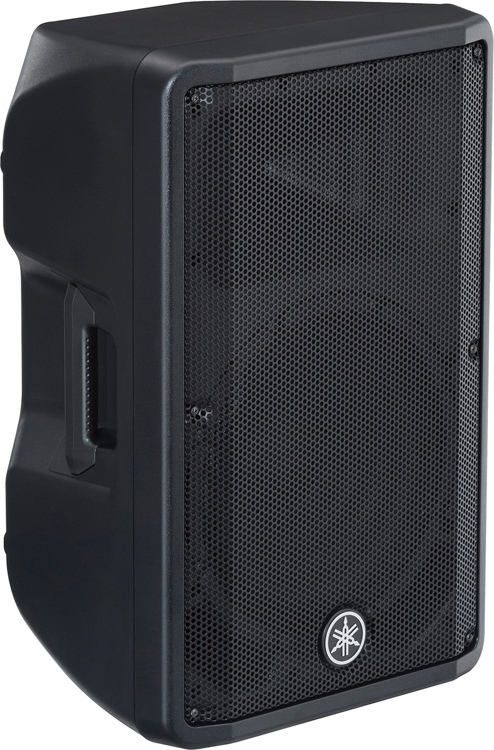 Whether you're looking for a convenient stage monitor or a portable PA system, the Behringer B205D is a solid choice. 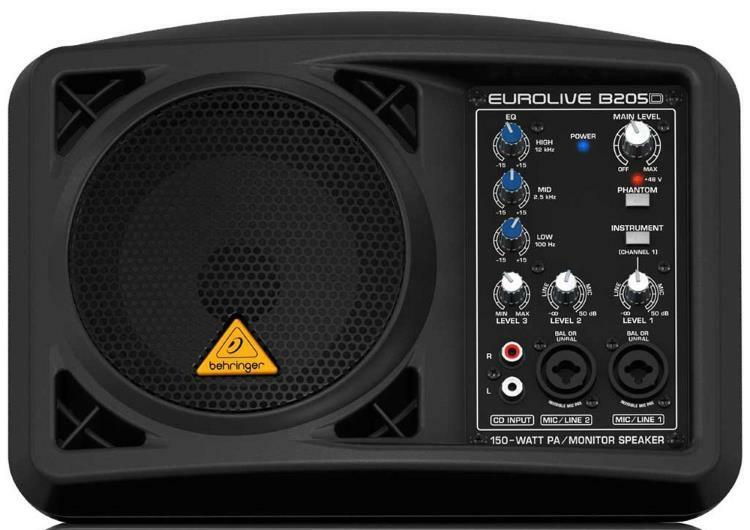 The most obvious advantage of the Behringer Eurolive B205D is its portability, and it is the reason why majority of reviewers bought and loved the product. But it's not just about portability because many are pleased with how it sounds, and some are also impressed with how much it can project for its size. From small cafes to a Las Vegas rock band stage, the general consensus is that it gets the job done quite well for the size. The ability to be mounted on a mic stand is also a plus, allowing the performer to better hear the sound coming off the speaker, and giving them easier access to the onboard controls which include a 3-channel mixer and EQ. There were some who complained that they received the unit with some defects, while others had problems within a year. These can still be covered by warranty so it's not necessarily a deal breaker, especially considering the price tag. But it would still pay to handle and setup this compact active speaker carefully, specifically when mounting it on a mic stand, you don't want it to fall down during a performance. Easily the best value compact stage monitor on the market today, since you can save a lot by buying this unit, we recommend that you also get a mic stand to get the most benefit. If you already have an amplifier, or you want to setup your stage monitors using a dedicated amplifier, then check out these four highly rated passive stage monitors. The Mackie C300z's ratings have increased enough to secure a spot in this update. Since it is a passive speaker, there's not much going on in terms of extra features, but it does stand out with its non-traditional form factor, 12" LF Driver and relatively big 1.75" HF driver. Speaking of form factor, tilting the C300z on its side allows it to work as a floor monitor with extended low and high frequencies thanks the size of its drivers. The Mackie C300z simplicity and practicality continue to win the hearts of many users. Most of which are happy with how it provides good sounds without the hassle of having to find a power port to plug it in. A number of users also commented on its "clear, crisp and distortion free" tone. One even noted that it sounded clean even with the kick drum mixed in. For a passive 12" speaker, the Mackie C300z is quite heavy, but this extra weight is justified by reports of users who are happy with its solid and reliable build. This affordable 12" passive speaker is a great low-cost option, do check it out if you're budget is limited. 88 out of 100. Incorporating 60+ ratings and reviews. The SM12V continues the success story of Yamaha's Club Series line, which as the label implies is now on its 5th iteration. Stand out features of this speaker include the Eminence designed 12" speaker, and its larger than usual 2" tweeter. This works in conjunction with its bulky enclosure for improved high power handling and provides enhanced bass frequencies and projection. Having mentioned all that, its best feature is still its longevity and reliability, as attested to by the many positive reviews that it continues to receive. The Yamaha Club V Series SM12V speaker gets a lot of thumbs up from users who are impressed with its overall quality. This includes both its physical build and its sound, from the solid feel of its cabinet, to its well balanced sound. Some even used the SM12V as FOH speakers with good results, a testament to its inherent projection and clarity. There were a few who noted that the low-end is a bit lacking, while others wished for better positioning versatility. Still, the Yamaha Club V Series SM12V is a great buy for anyone looking for a tried and tested 12" floor monitor. 88 out of 100. Incorporating 20+ ratings and reviews. The Yamaha Club series has been a long time popular choice for many, and so it is not surprising that the fifth generation secured a second spot in this list with the SM15V. Compared to the previous versions, this one has a larger enclosure for better low-frequency performance, improved HF and LF drivers for higher power handling, enhanced crossovers, and sturdier grilles. With its peak power at 1000W, this passive stage monitor can get loud when needed, and with its bigger 15" LF driver, it can handle instruments with extreme lows, like kick drums and bass guitars. Loud and clear is how many describe the Yamaha SM15V. As a monitor, many liked its high headroom and good projection, easily handling loud instruments with extended bass like drum kits and bass guitars. Another common theme among reviewers and experts is their appreciation of the unit's clarity and audio quality. The company attributes this to the help of Eminence which custom designed the drivers to meet Yamaha's preferences. There were some low ratings that were attributed to shipping issues, which is unfortunate. Some complained about the bulky size of this speaker and its weight, but then again, this should be expected of a bigger 15" woofer. Overall, the Yamaha Club V Series SM15V is highly recommended. 87 out of 100. Incorporating 20+ ratings and reviews. 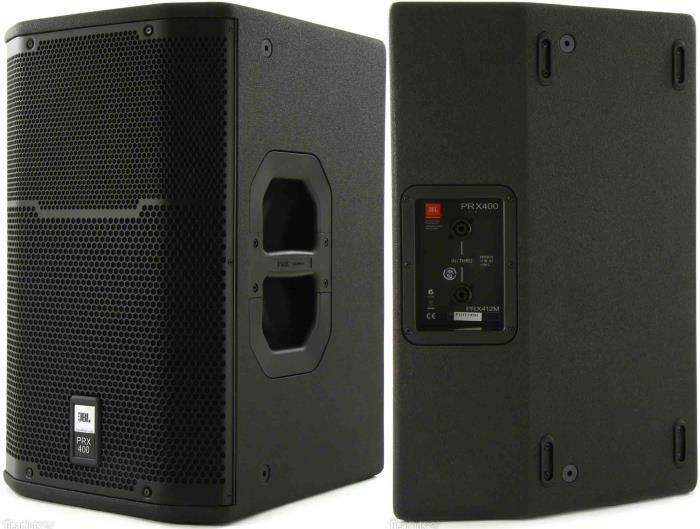 JBL describes the PRX412M as a multi-purpose passive speaker, able to handle monitor and FOH duties. It features a 12" woofer paired with a 1" tweeter, a typical configuration used on many speakers, only this one comes with JBL's brand of quality and reliability. To ensure durability and reduce resonance, the PRX412M comes with a birch/poplar cabinet with DuraFlex coating, while the front panel is secured by a 16-gauge steel grill cover. The quality of its craftsmanship continues to wow many users, with many of them pointing to how well the cabinets and inner workings are assembled. Sound quality also gets a lot of commendations from users of different backgrounds, including band musicians, venue owners, church sound technicians and more. Many users who switched to the JBL PRX412M also appreciate its lighter weight, when compared to others of the same price and value. Not much complaint about its sound, but there are a few wished for extra handles. Its one handle design makes it difficult to carry around, especially when you have to climb up or down a flight of stairs. With JBL's big-brand backing and its positive market response, the JBL PRX412M is an easy recommendation. 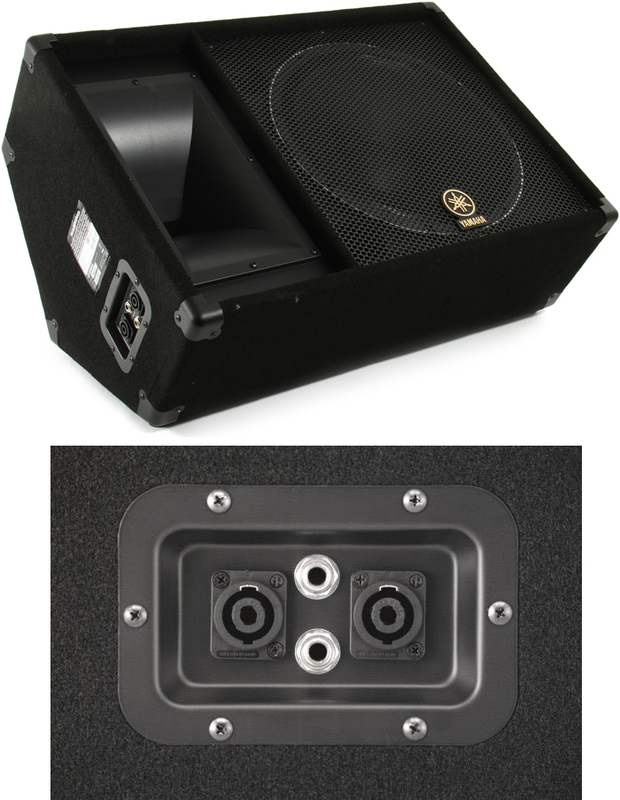 Powered stage monitors come with built-in amplifiers, while passive ones require a separate amplifier. There's no clear winner between the two, rather, they each have their own advantages over the other. Powered stage monitor speakers make setup simple. Passive monitors require an amplifier. The most practical method is to consider your existing equipment when getting stage monitors, if you already have a dedicated amplifier, then get a passive monitor, if none then go powered. Just remember that powered speakers need to be plugged into a power outlet. The number of monitors you need is influenced greatly by the size of the stage and the number of performers. The most ideal is to setup is a monitor for every performer, otherwise they may have to share a monitor.. A good rule of thumb is to start with two monitors for small to medium sized venues, and add as the need for more arises - you'll often need one dedicated to the drummer as it can be difficult to hear every performer from the back of the stage where the drummer is usually positioned. 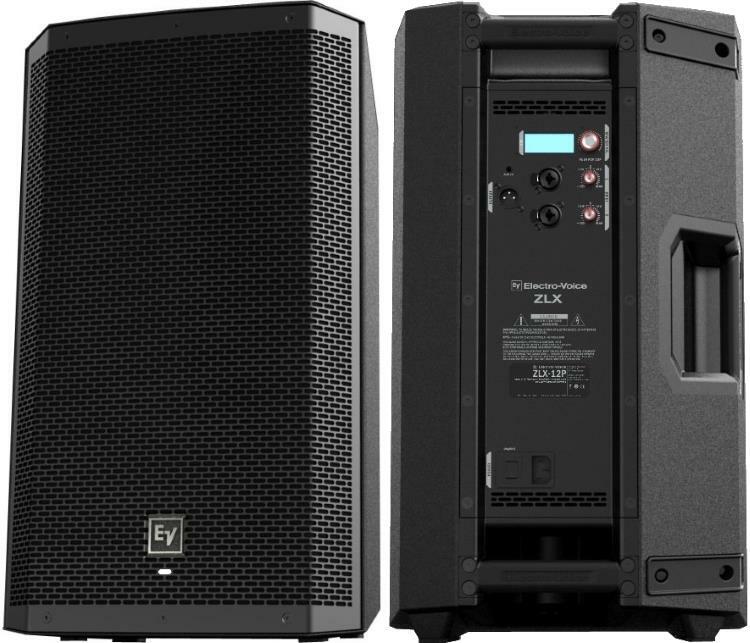 The size of the speaker (LF Driver) is significant in that it will dictate the stage monitor's bass handling and projection. You will want smaller speakers (10 to 12") for vocals and other common instruments that include guitars and keyboards. While bass heavy instruments like drums and bass guitars will require bigger (12" to 15") woofers - note that some drummers use an additional subwoofer for stage monitoring. Mobility is an important consideration if you're performance venue constantly changes, and to help with that, we have put the weight of each stage monitor listed on the features section. Most modern powered PA speakers can double as good stage monitors, making them great bang per buck choices. This means that they can serve as back up FOH speakers should your main one have problems. 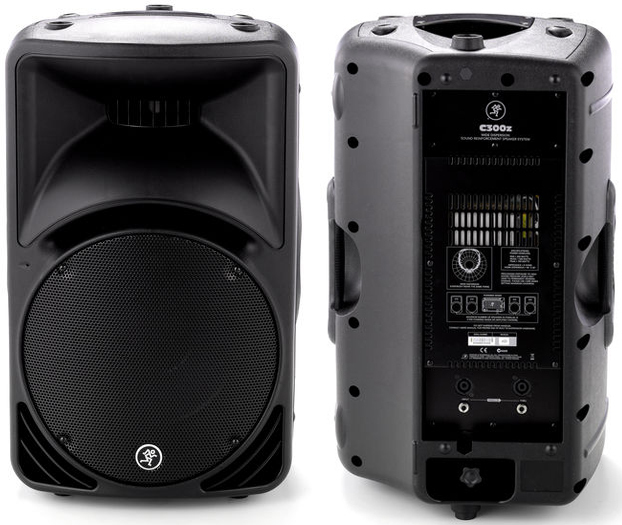 This guide complements our Powered and Passive PA speakers guides, and like those, this guide focuses on top rated stage monitors that are readily available at most major American music stores. For this update, we decided to limit the price range to $500, the price range that suits the vast majority of our readers. As always, we allow the numbers to speak for themselves by gathering relevant reviews, ratings and recommendations and feeding all of them into into the Gearank algorithm. The resulting scores allow us to rank each monitor via their ratings and we selected the highest rated ones to recommend above. The list is broken down into powered and passive categories for convenience. See How Gearank Works for further details on our methods. Submitted by Rico (not verified) on Mar. 11, 2017. Nice overview. I would add that the Peavey PV 12M horn drivers do blow. From my experience, that happens about every 8-10 years if the monitor is used 3-4 times a week in performance and rehearsal. My bands have pushed these units to the limit. They've been impressive and held up to everything we've thrown at them. How do I know they blow every 8-10 years? I date my drivers when I install them, originally because I was curious as to how long they last. I'm glad I started to do that as I doubt I would remember accurately when I had last replaced them. These guys are extremely durable and will deliver clean, crisp audio for decades. the pole mount allowed us to use one as a main when we blew a speaker once. And like most Peavey gear, these speakers will handle much more power than Peavey says they will. Submitted by BobWilliford (not verified) on May. 7, 2017. I'd like to have seen more reviews of monitors with a 10" woofer. I know that Yamaha makes one. I have two of the Kustom 10" and I like them for my situation which is in a small church with a relatively small staging area. There has to be other 10" monitors out there under $300. As part of our December 2017 update we looked very carefully at 10" speakers, however the passive ones at this size didn't rate highly enough for us to recommend them despite powered versions with this size woofer rating quite highly with some being recommenced above. Submitted by Jason Horton on Aug. 23, 2017. Today we removed the Kustom PA KPC10M because it has been discontinued. You can still read what we had to say about it here: Kustom PA KPC10M Meta Review. Submitted by Eric Dannewitz (not verified) on Jul. 30, 2018.